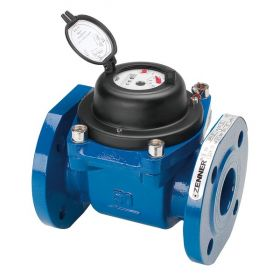 The WPH-N water meter by ZENNER is a Woltman parallel type meter with a parallel turbine shaft, for use in the cold or hot water area. Bulk water meters of the Woltman parallel type are always employed when high flows with a relatively constant flow profile are to be recorded. These are specially designed for municipal utilities companies, municipal water supply and industry and, thanks to their robust construction, can not only cover a large measurement range, but are very stable over the long term in terms of their measurement accuracy. The hydro-dynamically optimised turbine is reliably activated, even where the flow is minimal, and has a large enough "upwards" power reserve even to be able to record flow peaks reliably. Specially reinforced low-friction bearings guarantee the water meters' long service life. Reed contact, optical and NAMUR induction encoders can be retrofitted at any time without damaging the calibration seal. Hence, the water meter can be easily and flexibly integrated into existing data transmission or guidance systems. DN 40 DN 125 Standard 100 L/Imp. DN 150 DN 300 Standard 1.000 L/Imp. DN 400 DN 500 Standard 10.000 L/Imp.